electro-music.com :: View topic - KarmaFX Modular synth environment now for Mac OSX! KarmaFX Modular synth environment now for Mac OSX! Posted: Sat Feb 12, 2011 4:43 am Post subject: KarmaFX Modular synth environment now for Mac OSX! I first mentioned KarmaFX in the Windows software section, when it was freeware. Now it's payware, but it's also been ported to Mac OSX. Huzzah! 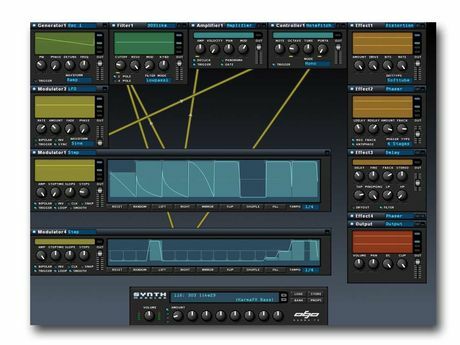 KarmaFX Synth Modular: Advanced Simulated Analog Modular Synthesizer and Effect Unit. # Full Modular patching of synth Components and Controls. # Internal high-frequency digital simulation of analog voltage levels. # Oscillator with phase, Detune and Pulsewidth that generates standard synth waveforms. # Dual Oscillator with Detune, Hardsync and Ring modulation. # Sampler, 16/24/32 bit Mono/Stereo multi sample player that imports WAV/SF2/SFZ files. # Multisample editing with Key/Velocity-ranges and Loop-Points. # Additive and Pad module with waveform and Harmonic Magnitude/Phase editors. # User defined waveforms and built-in presets of up to 1024 harmonics. # SVF, Zolzer, Moog, 303like, Formant, Comb, Allpass, Parametric and Shelving Filters. # 10-band digital and 31-band simulated analog Graphic Equalizers. # Amplifier and Stereo module with Panning, Volume and Velocity control. # Two channel Mixer with Ring modulation and Bit operations. # Delay, Reverb, Phaser, Chorus/Flange, Pitchshift, BitShuffler and Distortion effects. # Soft-knee Compressor with Peak/RMS detection and optional Sidechain. # 10 Octave/12 Note Pitch control with Detune, Portamento and Pitchbend support. # Controllers for Frequency Modulation (FM) and fast frequency sweeps. # Up to 16 channel Unison controller with Detune and Stereo pan spread. # 32 step, 4 octave Pattern controller with Hold, Loop, Legato and Arpeggiator. # Bipolar/Unipolar LFO with Tempo Sync, HFO with FM option. # ADSR and Multipoint Envelopes with Linear, Exponential, Hermite and Cubic curves. # Step Sequencer, Envelope follower, Sample & Hold and Decay modules. # Output module with Panning, DC removal, Volume and Clip control. # Noise generator, filtered Pink, White and Brown Noise with Frequency Sync control. # Input generator so synth can function as an Insert effect. # Full stereo support (selected modules can run in mono to save CPU cycles). # Patches are built up of Generators, Filters, Amplifiers, Controllers, Effects and Modulators. # Up to 49 simultaneously running modules (8 modules per group and 1 output module). # Instant visual feedback on all controls. Frequency, Time/Amplitude, Modulation, etc. # Optionally see knobs and sliders animate as they are modulated. # Choose between Mono, Legato, or up to 16-voice true Polyphony. # MIDI modulator modules for MIDI Controller, Velocity, Aftertouch and Pitchbend input. # 128 user-assignable Automation controls with MIDI Learn. # Fully skinnable GUI: Optional skins are bundled with the installation. # 7 banks of pre-made KarmaFX patches + userbanks. (More than 1300+ patches total). £80 gets you a Nord G2-ish modular for you Mac. Not bad eh?